Of the 16 Baumann Skin Types, half are characterized as “sensitive.” However, there are many things that people mean when they say they have “sensitive skin.” It is important to identify which subtype of sensitive skin you have in order to choose the proper skincare regimen. All four sensitive skin subtypes have one thing in common: inflammation. Skin inflammation happens when inflammatory factors in your body stimulate your blood vessels to dilate and your mast cells to release histamine. This leads to redness, swelling, and itching. There are various causes of inflammation including trauma, the immune system, prostaglandins, cytokines, chemokines, bradykinins, and toll-like receptors. All of these complicated pathways lead to the same thing- dilated, leaky blood vessels. Inflammatory pathways create havoc in the body by stimulating other pathways. Once these get turned on they keep affecting each other so that it is difficult to turn inflammation off. Inflammation is the cause of many unwanted issues such as skin aging, uneven pigmentation, scaling, redness, loss of radiance and pimples. When these inflammatory pathways are turned on, various cells produce inflammatory factors which increase prostaglandin production, turn on parts of the immune system and activate genes that cause damage to the skin. Even if you don’t fully understand the science of inflammation, it is important for you to know that inflammation is the root cause of many problems that can lead to what we call “sensitive skin.” There are 4 main types of sensitive skin that are divided based on symptoms of inflammation. Many people suffer from one or more types of sensitive skin at the same time. Although each type experiences inflammation—they all have distinct characteristics, causes and treatments. Acne is a common skin problem for teens and many adults. It is characterized by papules, pustules, and whiteheads and blackheads (called comedones). Severe acne can lead to cysts and scarring. Using a consistent daily treatment regimen is important to treat acne because the bacteria that causes acne tends to reproduce itself every 12 hours. This means that you need to treat acne twice a day, or you can’t get ahead of it. The acne cycle is about eight weeks, so it can take up to eight weeks for your acne treatments to work. Many people get discouraged around 4 weeks and stop using their acne regimen. It is crucial that you continue to use treatments such as salicylic acid, benzoyl peroxide, and retinoids consistently and allow them enough time to work. 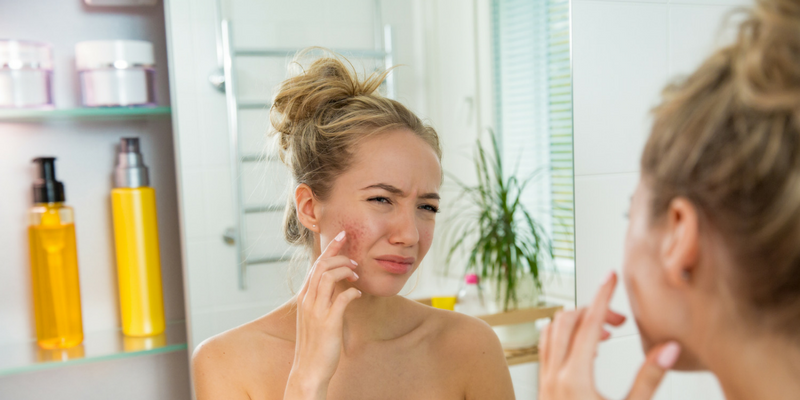 Don’t make the mistake of stopping your acne treatments when the acne disappears because you will need a consistent skincare regimen to keep the acne from recurring. As a side note, benzoyl peroxide and salicylic acid can help treat acne that you currently have, but the best prevention for future acne is a retinoid. Rosacea is a progressive condition that tends to show up after age 25, particularly in fair-skinned people. It is characterized by facial flushing/redness, stinging, broken blood vessels, and a feeling of facial warmth that comes and goes. Some rosacea patients get pimples that look like tiny mosquito bites or little pustules. It is best to treat rosacea early to prevent its progression, so if you notice any of the signs of rosacea, be sure to see a dermatologist so you can get an accurate diagnosis and start treatment right away. Do not wait until rosacea is severe to treat it. Eat anti-inflammatory foods like salmon, olive oil, fresh fruits and vegetables, and dark leafy greens. Use anti-inflammatory skincare ingredients like argan oil and feverfew. Avoid certain products and treatments that can worsen your symptoms, such as hydrocortisone and other topical steroids, benzoyl peroxide, facials, hot waxes, and strong chemical peels. Avoid triggers like alcohol, spicy food, and extreme weather changes. Talk to your dermatologist about the latest rosacea treatments like Rhofade™. Stinging, itching, burning, and other related skin discomfort are a result of triggers that affect sensitive nerve endings in some people. While the exact cause of stinging is unknown and can vary from person to person, we do know that avoiding certain topical ingredients can help to relieve stinging and other unwanted effects. Vitamin C, alpha hydroxy acids, benzoic acid, and sodium lauryl sulfate are examples of ingredients to avoid if your skin burns or stings. Some people sting to the chemical sunscreen avobenzone, which is often the cause of eyes stinging from sunscreen. It is interesting that not all of these sting everyone who has “stinging” skin, so you need to learn what ingredient makes your skin sting and then avoid it. Rosacea types are more likely to also be “stingers.” You may temporarily become a stinger when you start retinoids because these can make your skin sensitive for the first few weeks. Once you’ve pinpointed the cause of your allergy, avoid those ingredients. The barrier can be strengthened with barrier repair moisturizers to help prevent a future occurrence. The most common allergens are fragrances and preservatives. Recently, a group of ingredients called alkyl glucosides, which are found in many “eco-friendly” products, have been linked with skin allergies. Natural sources of alkyl glucosides include coconut oil, palm oil, rapeseed oil, corn, wheat starch, and potatoes. While this isn’t to say that all alkyl glucosides are necessarily “bad” ingredients, its does mean that you may need to be careful about which eco-friendly products you choose if you have a history of skin allergies. You’ll find alkyl glucosides in many body washes, shampoos, liquid cleansers, moisturizers, sunscreens, and deodorants. Thus, if you are experiencing a rash and can’t seem to figure out what could be causing it, read the labels on your personal care and skincare products to see if many of them contain these ingredients. Then, see your dermatologist for a patch test to help you determine the specific cause of your allergy. Managing sensitive skin can be difficult, but the proper use of anti-inflammatory ingredients can help to keep inflammation away. To learn more about inflammation, skin types, and how to properly care for your unique skin, follow Baumann Cosmetic Dermatology on Facebook, Instagram, and YouTube, where you’ll find tons of skincare advice from board-certified dermatologist Dr. Leslie Baumann. If you’re struggling to take care of your sensitive skin and calm inflammation, redness, and other related symptoms, you can contact Baumann Cosmetic Dermatology online or email info@derm.net to schedule an appointment.